Trailer trials and tribulations... 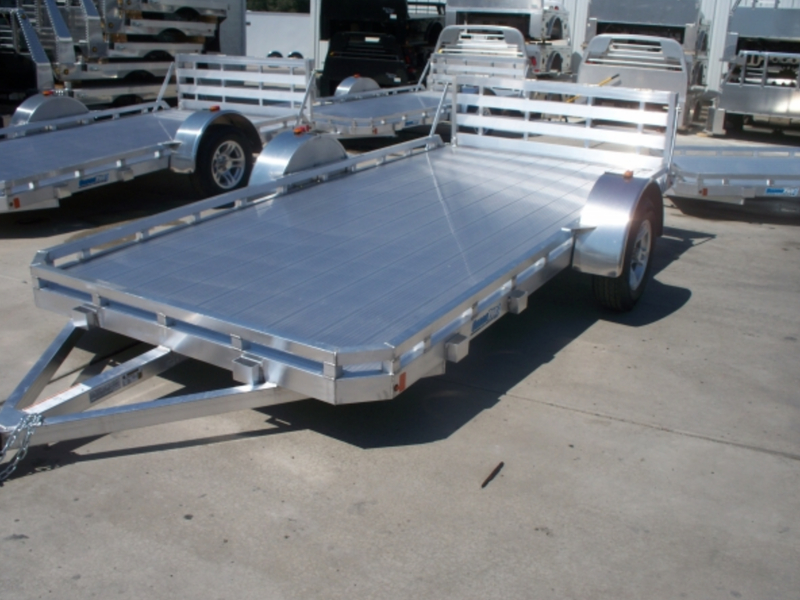 Yesterday I visited a local trailer dealer to look at aluminum utility trailers, similar to the one at right. 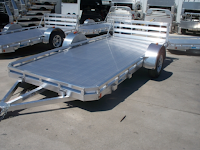 I was surprised at how reasonable the price was, and how nicely the trailer was made – so we quickly came to agreement and I decided to buy it. I want a trailer for towing behind our Model X – something big enough to carry 12' long lumber and 8x4 sheets of plywood, and this one is just about perfect for that sort of use. It weighs just 420 pounds, a spec with more impact than just being good for towing behind an electric car: at that weight, this trailer doesn't require registration or licensing in Utah. Hooray! The towing capability was one of the things that attracted me to the Model X in the first place, but we have never tried to tow before. The hitch receiver in the Model X is removable, and I've been carrying it in the car's “frunk” ever since I bought it, over a year ago. Yesterday the trailer folks helped me install it – except that we couldn't! We thought at first that we were doing something wrong, but then we found a YouTube video demonstrating how to do it – and it became clear that there was something wrong with my hitch receiver. Dang it! So I ended up just putting a deposit on the trailer to secure it, then I contacted Tesla with a request for assistance. A few minutes later, I had a service appointment for the next day (this morning) – both for the hitch issue and for my annual maintenance. So this morning Debbie and I headed down to SLC and the service center. We got there in plenty of time. We were given a loaner car, but sadly it wasn't a Tesla – it was a Cadillac SUV and since I can't say anything good about it, I won't say anything at all. We were given an estimate of half a day for the service, so we went to lunch at the Red Iguana (spectacular, as usual), and then spent three hours at the Loveland Living Planet Aquarium, 15 miles south of SLC in Draper. This turned out to be a lovely surprise – it's an incredibly great aquarium, though I think that name is a misnomer. It's more like a zoo with an aquarium attached. In addition to all the things you'd expect an aquarium to have, they also had two otter exhibits (with different species), a clouded leopard exhibit (with a breeding pair), great bird exhibits, and even some plants (palms, mostly). There's lots more there, too. We thoroughly enjoyed our time there, and we'll be back for sure. Then we headed back to the Tesla Service Center, where we got some good news and some bad news. The good news: they found the problem with the hitch receiver - some welding flashing that was preventing the receiver from fully inserting into its socket. A bit of careful grinding and that was fixed. The bad news: the estimate we'd been given for the routine service was badly off. Instead of a half day, it would take a day and a half. That meant we had to drive the Cadillac back home tonight, and we'll have to drive it back down to SLC tomorrow. Driving that conventional car 70 miles back home was ... a really downer experience. I am so completely spoiled by my wonderful Model X! The Cadillac's two-chipmunk engine got the car to 80MPH, but it took a couple miles to get there, instead of the 200' or so that the Model X takes. The ride was so mushy that I was afraid there was something badly wrong with the suspension – but apparently that's intentional. Going uphill in Sardine Canyon required keeping the accelerator to the floor to stay at 65 MPH – and all the while the engine is making alarming noises. Then the Cadillac's “auto-stop” feature was constantly making me think the car had died. That feature is intended to save gas – a laudable goal – but it does it by shutting off the engine whenever the car stops moving. Even at a red light! The engine automatically restarts when you take your foot off the break, but of course there's a brief hesitation before it can actually apply power to the wheels. It's such an awful driving experience after being used to the Model X!